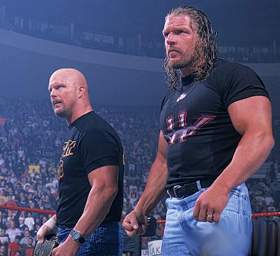 - WWF Backlash '01 (April 29) = The Two-Man Power Trip (Austin & Helmsley) defeated the Brothers of Destruction to win the Tag-Team Titles. Austin's World Title and Helmsley's IC Title were also both on the line. - WWF Insurrextion '01 (May 5) = The Two-Man Power Trip lost a "Handicap" match to the Undertaker. - WWF Judgment Day '01 (May 20) = Triple H was beaten in a "Chains" match by Kane, who won the IC Title. Later on, Austin retained the WWF World Title, winning a "No Holds Barred" Match over the Undertaker.